Peaches, one the most popular fruits to date, have been enjoyed by people all over the world largely due to its sweet and tarty flavor and its fragrant aroma. Peaches are drupes that belong to the same plant family as nectarines, plums, and almonds. The fruit is native to China, where it is considered a symbol of good luck, protection, and longevity. People in the U.S. celebrate August as the National Peach Month. Peaches are relatively high in vitamin C, which combats the harmful effects of free radicals. The fruit is also notably rich in phenolic acid and carotenoid that contain anti-tumor and anti-cancer properties. According to previous studies, the chlorogenic and neochlorogenic acids in peaches are found to inhibit the growth of breast cancer cells. On the other hand, the ample beta-carotene supply in peaches are known to stave off lung cancer. Additionally, the fruit’s high fiber content in found to reduce the risk of developing colorectal cancer. Peaches are also high in potassium, fiber, choline, and vitamin C, which in turn reduces the risk of cardiovascular disease onset. Studies have shown that consuming more than 4,000 milligrams of potassium may lead to a 49 percent lower risk of death from ischemic heart disease. Additionally, the phenolic compounds in the peel and pulp of peaches are found to lower bad cholesterol levels while simultaneously raising good cholesterol rates. The fruit is notably high in magnesium that helps relieve stress and anxiety. The mineral is also touted to keep the nervous system calm. This lowers the risk of cognitive disorders such as Alzheimer’s disease. On the other hand, the high fiber content in peaches are known to improve blood glucose, lipid and insulin levels in patients with diabetes. The fruit’s ample beta-carotene content are known to prevent the onset of various vision-related conditions. According to previous studies, the beta-carotene in peaches help stave off xerophthalmia and blindness. 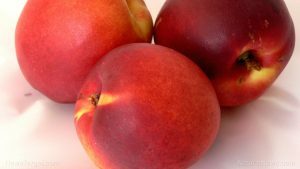 Likewise, the high lutein and zeaxanthin content in peaches provide protection against age-related macular degeneration. In addition, peaches are highly valued for their beneficial effects to the digestive system. The fruit’s alkaline and dietary fiber content are found to keep stomach disorders — such as constipation, hemorrhoids, stomach ulcers, gastritis, and irregular bowel movements — in check. The fruit’s laxative and detoxifying properties are also touted to rid the body of harmful toxins and eliminate kidney and bladder stones. Likewise, the bioactive components in peaches are found to induce weight loss and prevent the onset of obesity. The fruit’s rich iron content is also known to promote red blood cell production. Furthermore, the fruit is touted to boost the immune system and promote healthy skin and bones. Peaches are especially beneficial to the digestive, circulatory, and nervous systems. The fruit also supports the immune system and promotes healthy eyes, skin, and bones. Peaches are a popular staple in a variety of desserts, especially in baked goods. Peaches are widely used in pies, tarts, and cakes. Delish.com has compiled a number of interesting recipes using peach. Peaches prevent cancer, heart disease, and diabetes. Peaches stave off digestive disorders, Alzheimer’s disease, and eye conditions. Peaches benefit the digestive, circulatory, and nervous systems. Peaches support the immune system and promotes healthy eyes, skin, and bones.